The asscher cut diamond peaked in the 1920s when the Art Deco movement brought the cut into the forefront of diamond enthusiast’s minds. It remained a cut that was often seen in vintage rings until 2002 when it began to make a comeback. This comeback was approximately 100 years after the first cut associated with the word asscher was ever made. Why Asscher Cut for Your Diamond? 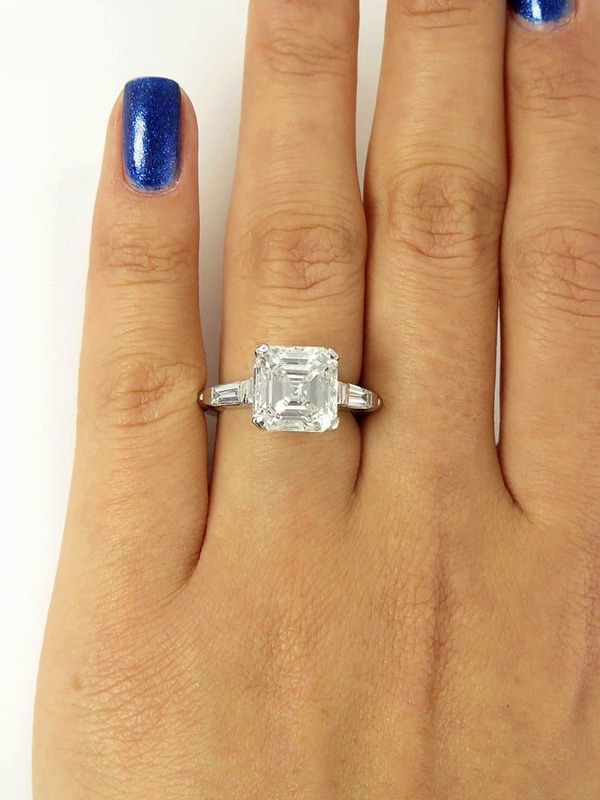 The asscher cut is similar to a square emerald cut in shape, but it has a higher crown and larger step facets. It also has a smaller table. All this combines to give the asscher cut incredibly clarity. 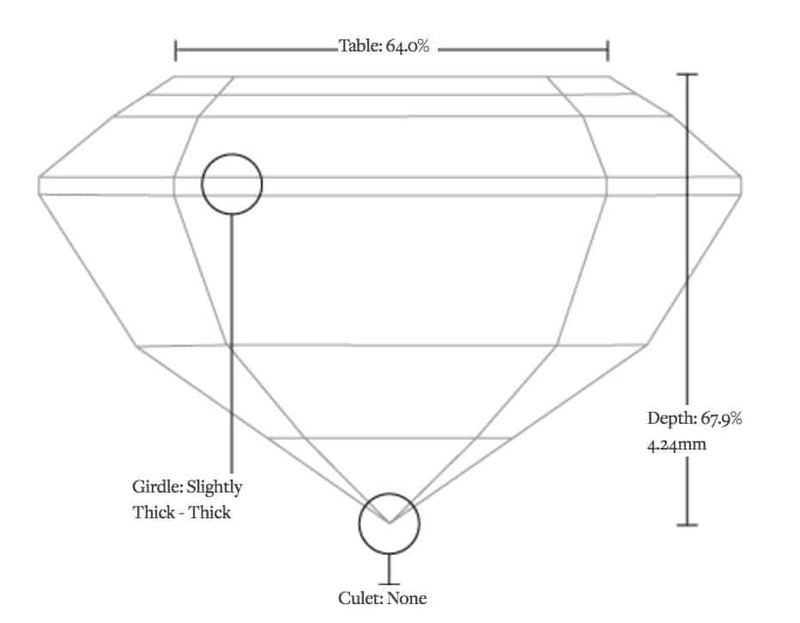 The asscher cut diamond will have a length to width ration of between 1.00 and 1.08. The asscher cut diamond is often comparable to the emerald cut, but the steep corners give it the impression of a octagon. The steps of the diamond itself create a clear table that reflects light and creates more sparkle and fire than some other diamond cuts. The asscher cuts available from Brilliant Earth are conflict free, which means that the diamonds were ethically sourced from mines that are not tainted by worker exploitation, violence or child labor as well as environmental harm. They range in color from D through J and all come with GIA certification like this 1.52 carat with a color of J and very good cut. It has the GIA report on grading as well as an origin certificate. It has a slightly thick girdle and a table that is 64.0%. If you’re looking for an asscher diamond with baguettes for an engagement ring, you can find one at The Diamond Company. The ring shown here is platinum with an asscher cut and tapered baguettes totalling two carats. The engagement ring is available in a variety of metals like 14k or 18k white gold or 14k or 18k yellow gold, too. When a diamond is ordered from The Diamond Company, they’ll send it to U.G.L. for verification and appraisal. You’ll know exactly what the company is sending since they verify it. After appraisal, it’s sent to you via U.S. Registered and Insured mail. This keeps you safe and confident in your purchase. 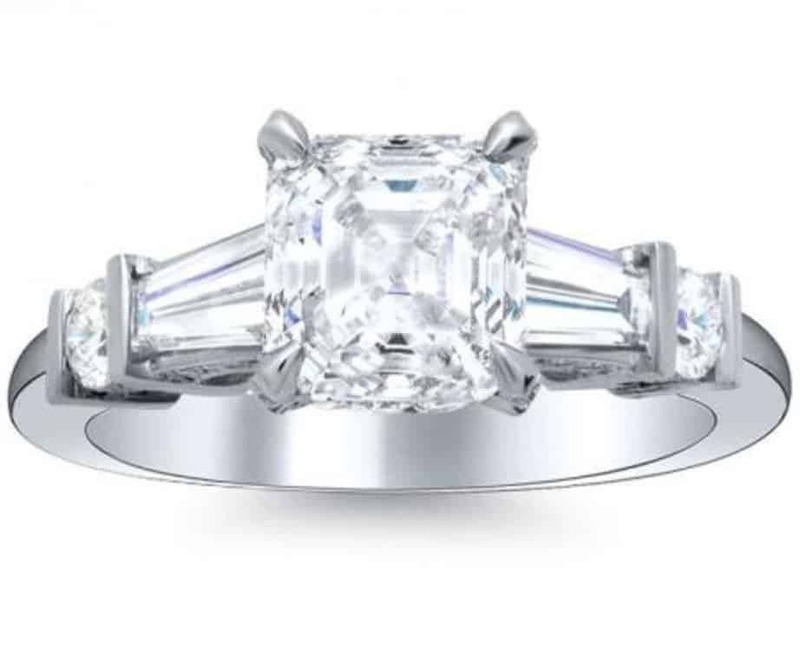 The asscher diamond cut from Blue Nile has a signature style that results in wider corners, taller crown height and a smaller table. This is said to give the diamond more brilliance and reflective quality of light. The crown height is always greater than 10%, and it has a culet that enhances the appearance. 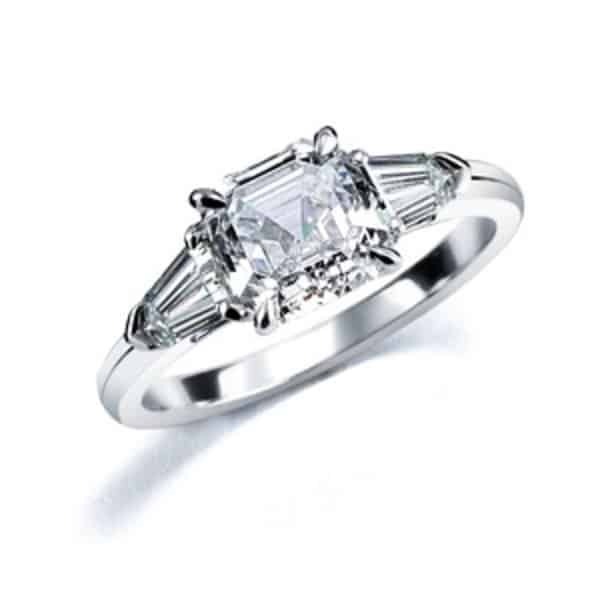 This asscher cut diamond in a platinum setting features 1/6 carat weight diamonds. It’s available in sizes 3 to 9 in platinum or white gold. It has two tapered baguettes on the band, too. It has a width of 2.6 mm with a minimum color of H and a minimum clarity of VS2. 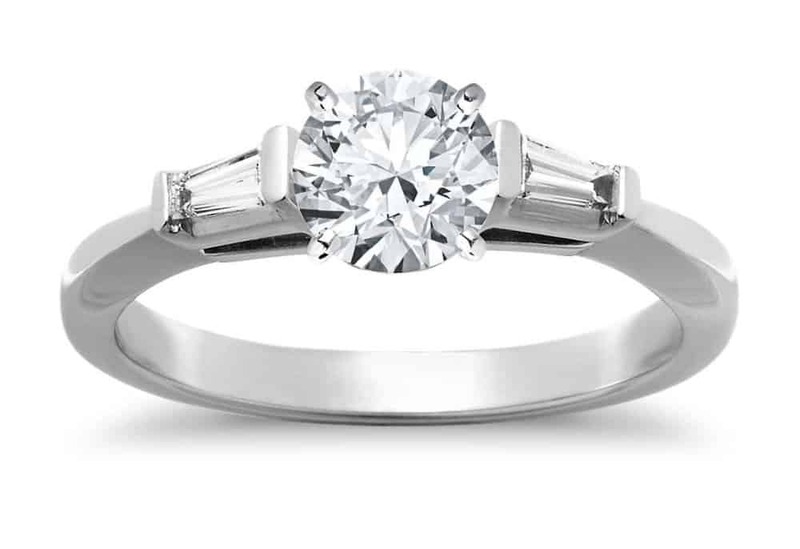 Every order from Blue Nile offers free FedEx shipping, and delivery time can vary depending on the setting as well as the diamond. There are 30 day returns for rings you don’t completely love. They also have flexible payment options and financing on orders over $1,500. A Royal asscher cut diamond is another variation of the standard asscher cut. It has 75 facets and a higher crown. The high crown like the one from Blue Nile creates a highly reflective quality that lets in a ton of light. It give the diamond more fire than other cuts including other asscher cuts. The Asscher Diamond Company is the only one authorized to sell their patented diamonds, so if you’re looking for one, you’ll have to purchase directly from the company or a licensed seller. The company is still run by an Asscher, who were the first to create this cut of diamond. The royal asscher diamond with tapered baguettes is available in 18k white gold, yellow gold or platinum. 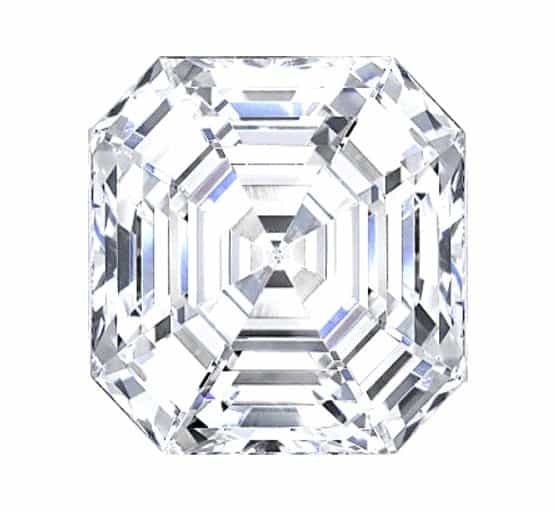 The Diamond Mansion has a 1.54 carat asscher cut natural diamond in a variety of color and clarity options. Along with the center asscher diamond, there are tapered baguettes on the shank as well as two round pave diamonds. Lumera has loose diamonds that can be paired with your own tapered baguettes. With them, you can design the engagement ring of your dreams. 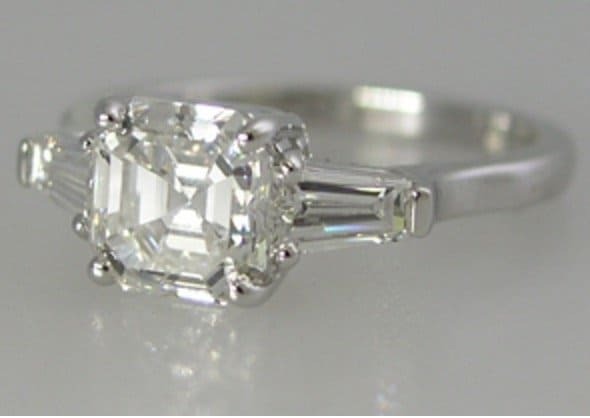 This asscher cut diamond is has a length of 5.66 and a width of 5.41. With those measurements, you have a length/width ratio of 1.05. It’s a 1.03 carat cut with I color and VS1 clarity. It’s an Excellent cut with good symmetry. It has no culet and a table of 62%. The company offers a GIA certificate with all their diamonds as well as a lifetime guarantee. There are 30 day returns as well as free shipping. Whether you decide to build your own stunning asscher cut with tapered baguette engagement ring or buy one already created, you’re getting a beautiful cut that always looks larger than it is. They’re clear and brilliant with stunning fire and shine.